Tucked up above Pasadena against the foothills of the San Gabriel, Altadena can feel a little like living on the northeast edge of the Los Angeles basin. The name Altadena derives from the Spanish alta, meaning “upper”, and dena from Pasadena. Eaton Canyon, named for an early resident Benjamin Eaton, offers a cool natural respite from warm summer months. Many neighborhoods in Altadena have views of the San Gabriels Mountains and the highest elevation may experience a dusting of snow when the mercury really gets low. 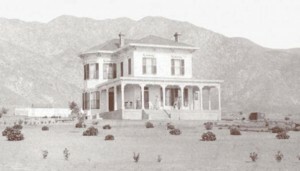 The lovely country life attracted many early barons to build ‘winter homes’ in Altadena. Dignitaries such as Andrew McNally, the printing magnate from Chicago and his good friend Col. G. G. Green built mansions on what was to become Millionaire’s Row. Newspaper moguls William Armiger Scripps and William Kellogg built side by side just east of Fair Oaks Avenue and Zane Grey owned a spread home nearby. Many fine homes still exist today in Altadena, offering a little bit of country on the edge of the city.